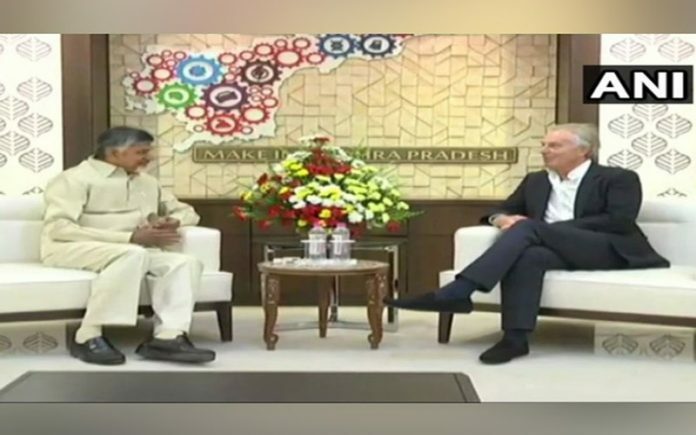 Amaravati: Tony Blair, Former United Kingdom (UK) Prime Minister held a meeting with Andhra Pradesh chief minister N Chandrababu Naidu on Monday at the Real Time Governance Centre (RTG) situated in the secretariat. Welcoming the world leader, Naidu recalled the fact that the British politician was the youngest to become prime minister of his country at the age of 43. He also reiterated Blair’s enormous contribution to the governance practices by being the first to introduce the National minimum wage act and Freedom of information act. Furthermore, Naidu shared the vision he has for the state and how it has been equipped far better than before through Real-Time Governance. He also shared his seven missions for the state’s progress and five grids that would enable these missions. The Blair – Naidu bonhomie dates back to the former’s visit to Andhra Pradesh during Naidu’s previous tenure in 2002 when Blair and his wife were taken on a visit to experience rural India by Naidu himself. Blair recalled his last visit and said “It has been 20 years and we came into the leadership positions at the same time. I stopped. You survived ageing and kept going”.